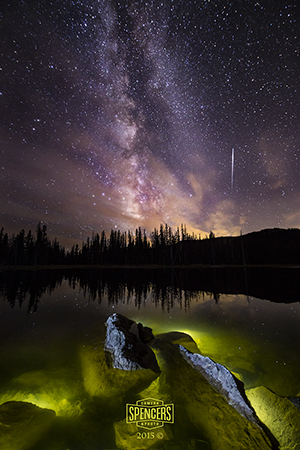 Nightscape and Night Sky Photography Tips - Part I - Focus. One of the most difficult things when shooting nightscapes, astroscapes, or night sky photography is insuring you have sharp focus for those "pin point" stars. Most cameras struggle to acquire focus in dark circumstances and manually focusing is very difficult when there is virtually nothing bright to see. Generally speaking, the cameras autofocus system will be able to focus more accurately than you can, especially in dark situations. We prefer to let the camera set the focus and then check it by shooting a few test shots. If using a mirrored/optical viewfinder camera we prefer to use Live View to set focus as the camera will utilize the actual imaging sensor to "see" the subject, thus providing a more accurate focus. 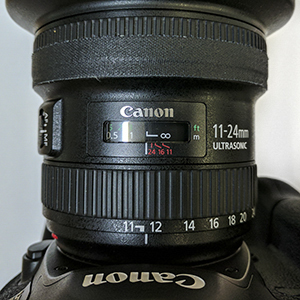 Locking in infinite focus will work very well for most subjects but will need to be adjusted frequently if shooting a subject that requires a focus stacking technique. We'll cover focus stacking techinques near the end of this page as well. One of the best ways to insure you will have sharp infinity focus is to set the focus during the day or when you know you will have something bright to focus on. Set infinite focus during the day aiming at a distance mountain range or other distant subject. After the camera has acquired focus lock the lens focus barrel in place buy taping it down. Then set the camera and/or lens to "Manual Focus" so it won't try to reacquire focus later. After taping the focus barrel in place check focus by shooting a few test images and review. If it's off, reacquire focus by using the same steps again. If pre-focusing does not work for you or you find that your pre-focus setting has been lost or wasn't accurate, you can use a bright light source to focus on. Sometimes a distant road can provide bright headlights to focus on, a street light in the distance, partial or full moon, or even a bright star or planet (Jupiter, Venus or Saturn) can be used as a reference for focus. Sometimes you may need to ask a friend to carry a bright flashlight out into the distance to focus on. If alone you may need to set a light in the distance, return to the camera and lock in your focus, then retrieve the light. I've used the headlights of my car for a focus source in the distance (when visible) by pressing the "Lock/Unlock" button on the key fob to flash the headlights long enough to achieve focus. Generally we prefer the focus subject to be at least 400-500 feet away or more. Most wide-angle lenses will be in infinite focus range after about 20-30 feet and beyond, meaning if you focus on something 20-30 feet away everything beyond will be in focus as well. We don't rely on this rule and prefer to set focus using a subject much farther away, just to be safe. After acquiring focus check accuracy by shooting a few test images and review. If it's off, reacquire focus by using the same steps again. One of our favorite methods of focusing under very dark skies is to use a laser pointer to give a reference "spot" for the camera to focus on. A very bright Green laser pointer works well and can be seen by the camera for a long distance, well over 300 feet. Shine the laser on a distant object (not an airplane) and allow the camera to acquire focus on the bright spot created by the laser. This method will provide a bright spot the camera will be able to "see" very well. You can see it as well for manual focus if desired. Again, once the camera has acquired focus, tape the lens focus barrel in place; lock the camera and/or lens into manual focus, so it won't wander out of focus. Shooting dark subjects that requires focus stacking techniques can be a challenge. You can use any of the above mentioned methods to achieve focus but must be reset for each varying focal plane image. Meaning, once you shoot the infinity focus image you must reset the focus for something closer, requiring the use of lighting or a laser to acquire focus at the different (closer) distance. Once you have acquired focus for that distance, capture your image(s) and reset for the next focal distance. Continue doing this until you have captured all required images needed to provide a nice sharp stacked composite. If you want to then move the camera for a different composition you'll need to set your infinity focus again by using one of the previously discussed techniques, reacquire focus for each focus distance before shooting the images(s) for that distance and continue until all necessary focal distance images have been captured.